Here is a place to check out Alpana Station which is listed on South Australia\'s government website. I have not travelled this track myself so I am leaving a link to the S.A government website so you can find some information. 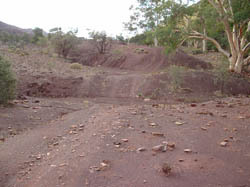 http://www.southaustralia.com/NationalParksReservesForests.aspx The Mt Samuel tour is a challenging four-hour, self-drive 4WD experience, incorporating Mount Buggery Gorge, panoramic views and numbered points of interest along the way. Alpana Tag-along offers full and half-day 4WD tours exploring the natural beauty of the Alpana Station area in the central Flinders Ranges. Most of the track is a easy/medium drive but not very challenging. The Mt Buggery Gorge Challenge is not too difficult if you take your time and pick your way through the large boulders and Old Gums. You do need good ground clearance.